So it would appear that MetLife Stadium will not become “Peyton Place”. 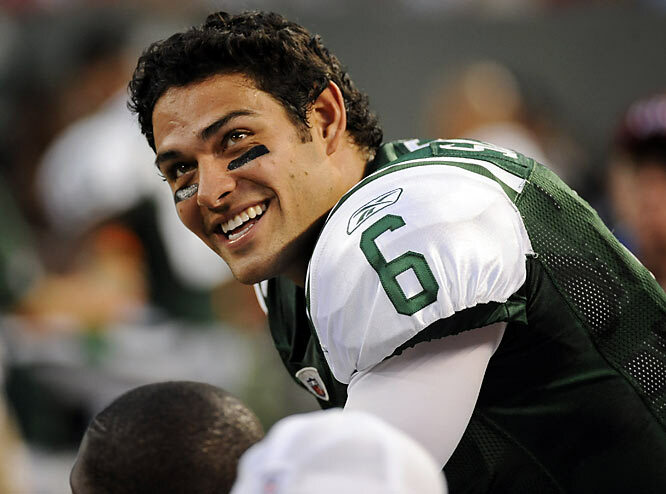 The Jets decision, last night, to extend the contract of Mark Sanchez all but precludes the possibility of the Jets making a play for Peyton Manning. I know that there has been some disagreement amongst Jet fans on this issue. Many felt the availability of Peyton Manning represented a once-in-a-lifetime opportunity to bring the future Hall of Famer to the Meadowlands and in the process make the Jets a sure favorite to be play in the Super Bowl next February in New Orleans. I, however, am not one of those Jet fans. I think the Jets made the right decision and will tell you why. First, Manning is 35 and coming off a lost season in which he did not play at all due to pre-season surgery on his neck. The Jets have had experience with QB’s in the 35+ range. Does anyone remember the Brett Favre fiasco? Now I understand that there are those that will say that there is no comparison. That Peyton is a much better QB than Favre. That may be so but we were sold the same song and dance four years ago with Favre; about how he is surefire HOF’er and how he would put the Jets over the top. Furthermore, a move for Manning on the heels of the Giants winning yet another Super Bowl would reek of a level of desperation that would overwhelm the stench of the swamp on which MetLife Stadium is built. Second, bringing in Manning would have all but guaranteed the release of Mark Sanchez. While not a perfect QB, Sanchez does not deserve to be discarded. Sanchez’s numbers have steadily improved over the course of his three years in the NFL. As a matter of fact, his first three seasons compare favorably, at least statistically, with those of Eli Manning, now considered amongst the “elite”. In their first three full seasons as starters Eli Manning is 29-19 while Sanchez is 28-20. Not to mention the fact that in his first two seasons he won four road playoff games and took the Jets to two straight AFC title games. The big difference is that Eli made the GIANT (no pun intended) leap of leading the Giants to Super Bowl in his third year but had lost is first two playoff starts in prior starts. Also consider that Eli spent part of his first year as understudy to Kurt Warner, a pretty good QB in his own right. Sanchez, by comparison, was all but immediately named the starting QB of the Jets, anointed the “Sanchize” and savior of the Jets, after only one season as starting QB at USC. I have long said that Sanchez is the kind of QB you can win with but probably not because of. While talented I do not think he can single-handedly lead a team to victory but he is still young and that could still come. Does he need to step up and take that next step? Yes. Does he need to concentrate more on football than on super models, starlets and celebutantes? Yes. Do the Jets need to bring in a credible backup to push Sanchez to excel? Yes. Do they also need to improve his protection? Yes. BUT the future still belongs to Sanchez. Lastly, I firmly believe that one of the prime reasons the Jets have been such a disappointing franchise throughout their history is because of impatience and institutionalized chaos. Since the year 2000 the Jets have had four different head coaches. The Giants have had two. The Pittsburgh Steelers have had two since 1969! Since 2000 the Jets have had four different starting QB; the Giants two; the Steelers three. They have repeatedly and consistently shown an inability of draft a plan and carry it out. This destruction pattern has to stop if the Jets are ever going to be successful. In my 30 years as a Jet fan I think Mike Tannenbaum is the best GM they have ever had. He has drafted well and has brought in good free agents when available. My one complaint is that he has tended to churn the roster a bit too much from one season to the next. However, he has put many excellent pieces in place and we all need to have the patience to see it through. There is little doubt that 2012 will be a critical season for the New York Jets. After a meteoric rise in their first two seasons together Rex Ryan and Mark Sanchez came back down to earth last season. Yet they finished the season 8-8 not 4-12. While not a great result it was not a disastrous one either. The old saying goes that the true test of a man is how he handles adversity. Rex, Mark and the rest of the Jets have experienced their first taste of adversity. They are either going allow it to make them better and come back stronger or they are going to let it tear them down. I certainly hope it’s the former.